TotalPack® Polypropylene Woven Sacks and Fabrics feature a PP/LDPE Lamination and are excellent for packing urea and cement. These tough BOPP laminated Woven Bags can also be used to package branded products, spices, pulses, dates, agro products, food grains, cattle feed, polymers, and other consumer products. The premium tightly woven polypropylene provides 1,600 hours of maximum UVI protection. You can put sand in a bag to create a sand-fill barrier to protect your property from floods, or fill the sandbags up with your products for easy storage, transit, and use. These durable sandbags can also hold heavy parts and supplies. Woven polypropylene sandbag resists punctures and tears. TotalPack® sandbags are manufactured by us right here in the United States. With TotalPack® you get the highest quality sandbag supplies for the lowest price guaranteed, delivered straight to your door. 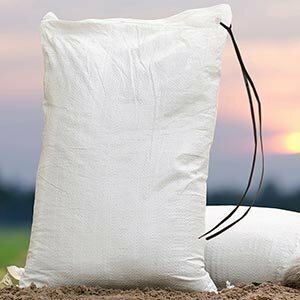 CAN ENDURE ANY ABUSE: Our 48" x 60" sturdy refillable sandbags are made of superior-quality polypropylene and are tightly-woven to ensure that they can resist punctures and tears without skipping a beat! Plus, carrying them is a breeze due to the handy ties! If you have any questions about this product by Totalpack, contact us by completing and submitting the form below. If you are looking for a specif part number, please include it with your message.